After reading this article you will understand how condensation forms on the inside (and outside) of the glass. When the Insulated Glass Unit is sealed together moist air is trapped inside. Manufacturers know this and that is why they make units with moisture absorbing materials on the perimeter (desiccants). A failed unit typically is one where the desiccants didn’t absorb the moisture enough or correctly (hence reason some units look failed on and off). If you have an intercept spacer then you have no chance of your IG unit lasting because most likely it was not sealed in a vacuum pack room. Want to lower your heating bill, feel warmer in the winter, cooler in the summer, and protect your furniture from fading? Read this article on the benefits of Low-E, Argon/Krypton gas, UV protection and triple pane window units. Price, Energy Efficiency and Longevity are the three factors you need to take into account when buying new windows. Read this article to learn how these factors should be weighted when making your buying decision. Did you know that windows aren't designed to last forever? Or that you can replace just the glass without replacing the whole window? Read this article to learn more about these and 8 other things every homeowner should know about their windows. Thinking about replacing your home's windows? Read this article before you buy. Learn why inexpensive vinyl windows fail and what you can do to assure a longer life for your new windows. Weathervane Wood Windows need regular maintance. If you haven't kept yours caulked and painted, your frames may have started to rot. Read this article to see how we can repair your frames and save you the cost of replacing the entire window frame. LIke all wood windows, Pozzi Wood Windows can rot especially their lower panels. Window Defoggers can replace the rotten wood in a Pozzi Window so you don't need to replace the entire frame. Read this article to see how we can repair your window and you can save big. Replacing a wooden door with glass window panels because it has rotted can be expensive. 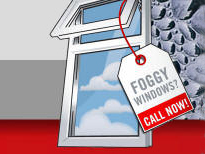 Window Defoggers can replace the rotten wood in a door at a fraction of the price of a new door. Read this article to see how we can repair your door without having to replace it.